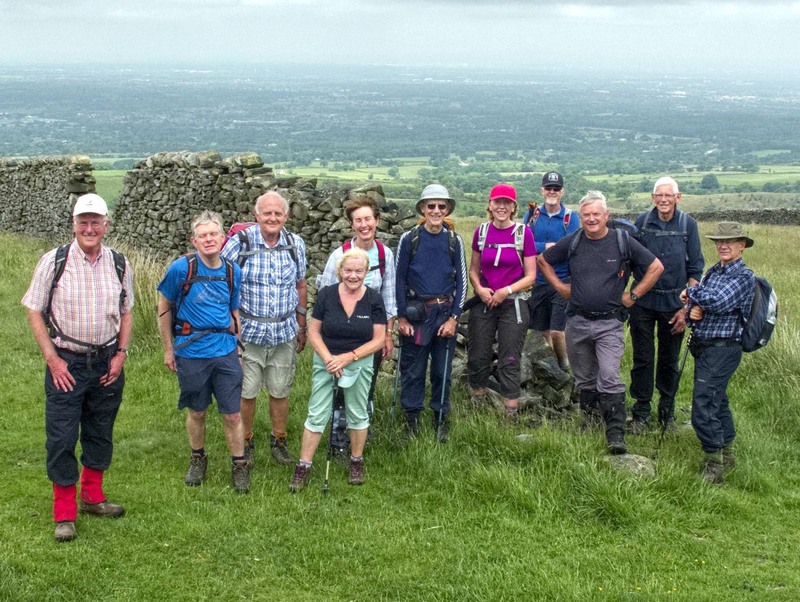 Tour de Pott Shrigley – the walkers pictured at Dale Top. Readers will recall the grand depart of the Tour de France in Yorkshire two years ago and more recently the Tour de Yorkshire. 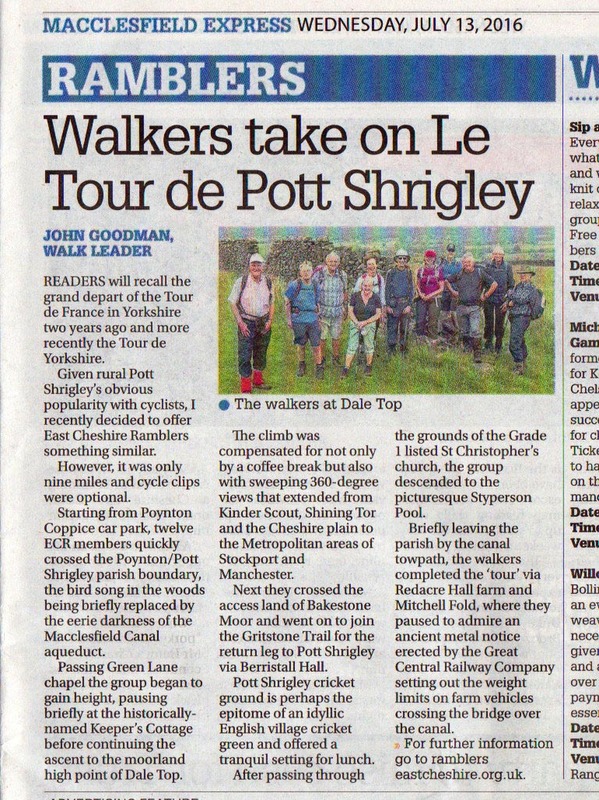 Given rural Pott Shrigley’s obvious popularity with cyclists, local resident John Goodman recently decided to offer East Cheshire Ramblers something similar. However, it was only nine miles and cycle clips were optional. Starting from Poynton Coppice car park, twelve ECR members quickly crossed the Poynton/Pott Shrigley parish boundary, the bird song in the woods being briefly replaced by the eerie darkness of the Macclesfield Canal aqueduct. Passing Green Lane chapel the group began to gain height, pausing briefly at the historically- named Keeper’s Cottage before continuing the ascent to the moorland high point of Dale Top. The climb was compensated not only by a coffee break but also with sweeping 360 degree views that extended from Kinder Scout, Shining Tor and the Cheshire plain to the Metropolitan areas of Stockport and Manchester. Next they crossed the access land of Bakestone Moor and went on to join the Gritstone Trail for the return leg to Pott Shrigley via Berristall Hall. Pott Shrigley cricket ground is perhaps the epitome of an idyllic English village cricket green and offered a tranquil setting for lunch. After passing through the grounds of the Grade 1 listed St Christopher’s church, the group descended to the picturesque Styperson Pool. Briefly leaving the parish by the canal towpath , the walkers completed the “”Tour” via Redacre Hall farm and Mitchell Fold where they paused to admire an ancient metal notice erected by the Great Central Railway Company setting out the weight limits on farm vehicles crossing the bridge over the canal.